Children learn best through play. Learning to read should always incorporate this principle. The Stepping Stones Together games are designed to help children connect the importance of learning to read with everything they do including playing games! This week my son who is using the Stepping Stones Together program wanted to play a new game with all of his current flashcards. We developed a game called Slap It which he absolutely loved. Ask siblings, friends, or relatives to play this game. This game requires an adult caller, 1 or more children learning the flashcard words, and at least 1 other child/adult player to compete against the child learning to read. 1. 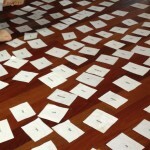 Have your child lay out as many flashcards, word side up, as he/she can handle without frustration. The caller will call out a word for example "they". The child(ren) and competitors will attempt to scan the sea of words to find the word called. If you have a child or adult reader playing against a new reader have them wait 5 seconds before searching for the word called to give the new reader an even playing field. The first one to correctly slap the word called by the caller wins that round. 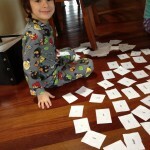 The one with the most flashcards after all words have been slapped wins the game. This is a great game to reinforce sight and high frequency words with your child! Let us know how it went with your kiddos! We'd love to hear from you here, through email at info@steppingstonestogether.com or visit us on FB.